Hebrew Letters that Change Pronunciation | Etz Hayim—"Tree of Life"
Some Hebrew letters change pronunciation. The diacritical mark—the dagesh—is a small dot in the letter. The dagesh has two forms—Dagesh Kal (meaning "weak/light", sometimes called Dagesh Lene) and Dagesh Hazak (meaning "strong", also called Dagesh Forte.) 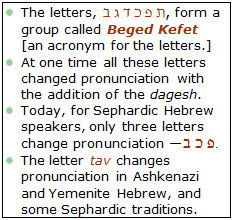 It is the Dagesh Kal that changes the pronunciation of the Beged Kafet letters. Dagesh Hazak has a different function—it has the effect of doubling the consonant. As a general rule the dagesh, when found in the Bet, Kaf, and Pey in the beginning of a word or syllable, is Dagesh Kal. The Dagesh Hazak is indicated if its occurrence is preceded by a vowel. Dagesh Hazak is not limited to the Beged Kafet letters. The Shuruk and Mapik may be confused with the dagesh. While they look the same each has a different function. The Shuruk is a small dot which follows a vav to form the vowel sound "oo." The Mapik is a small dot within the letter hey, (and, rarely, an aleph) when it occurs at the end of a word. The Mapik indicates that the hey is pronounced. 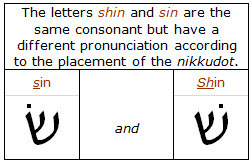 The Hebrew consonant Shin represents two slightly different sounds (phenomes). These sounds, sin /s/ and shin /∫/ (sh), are represented by the addition of dots to the letter Shin. Lesson 3. More about Hebrew letters.